Do you often change your mind ? I bought about 5 meters of black wool knit to sew two projects. The first one is a knock off this Marie St-Pierre dress (previously presented on the blog). The pattern is ready, I drew and I just need to cut the wool. The second one is this very interesting OOP Burda pattern that my generous friend Annette sent me. (She made 2 or 3 gorgeous tops with it, see the review here ). My plan was to sew the hooded top, add sleeves to it and make the hood in café au lait satin back crepe (100% silk). Those are plans I made last fall. Meanwhile, or last week to be more precise, I fell in love with this belt. When I say fall in love, I really, really, really mean it !!!! 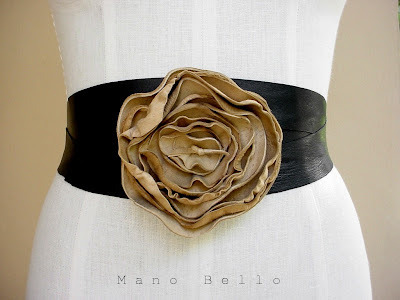 Now I am thinking, should I skip the Marie St-Pierre dress and design another pattern to show case this magnificent belt and still sew the Burda outfit or should I skip the Burda outfit and use the wool for ... a dress ... and still make the Marie St-Pierre dress ??? To show case the belt (not bought yet), I have in mind a knit dress, cut at the waist, with a fitted top, long sleeves or 3/4, boat neck and a full, full skirt that goes down to just under my calf... to be worn with high heel boots. First of all, what do you think ? And second of all, have you ever seen such a pattern? I never did... I guess I will have to make it (not complicated I know). For your information, the belt is for sale on Etsy. I agree with KayY - that was my initial thought before reading the comment. If you don't like that idea, try Vogue 8413. This pattern has a number of stunning necklines, is waisted but the shirt is perhaps straighter than you want. You could combine with another pattern. 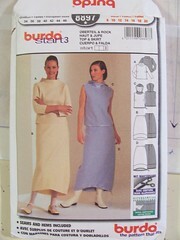 I hope that the Burda pattern is still in print -I've fallen in love with the idea of making it for winter. Thank you Gail for your suggestion. I have this pattern at home and I think that one of the neckline would fit what I have in mind. I will change the skirt style. I'll be upset if you don't make the Marie St-Pierre! I'm in love with that dress. As far as your dilemma, there's a third choice: why not make the St-Pierre and the new dress idea out of the black wool that you have and then pick out some new fabric for the Burda pattern? I love your idea of a slim top and full skirted dress to show off that incredibly gorgeous belt. Janie, I think you are right. Joanne and you convinced me not to abandon the Marie St-Pierre dress. I still have to figure out the gloves with the dragon humm what is the name for those ornaments ? Hmmm...the gloves with the dragon scales! I can't tell from that picture how they're constructed or whether they're in one piece with the dress, but my inclination would be to make the dress with plain long sleeves so I could wear it that way when I wanted and then to make the gloves separately out of the same fabric, very long, past the elbow, and add the funky dragon scales floating out of the glove's seamline. That way the dress could be worn with or without the dragon gloves according to dragon or non-dragon mood. Two more UFO's done, finished, completed ! SIMPLICITY 1069 CULOTTES / you look radiant!